August 6th, 2009 will be the latest day where Windows 7 enthusiasts will be able to download the official unmodified and untouched Windows 7 DVD ISO images, if not earlier. Windows 7 RTM is said to be build version 6.1.7600.16385, with general availability set on October 22nd, 2009. However, some people such as Microsoft partners, OEMs, MSDN and TechNet subscribers are expected to receive the final RTM copy of Windows 7 ISO images much earlier, which will then likely be leaked to Internet for downloading by everyone. Windows 7 RTM is said to be in the final stage of component sign off, which is expected to be completed by Wednesday, July 22nd 2009. 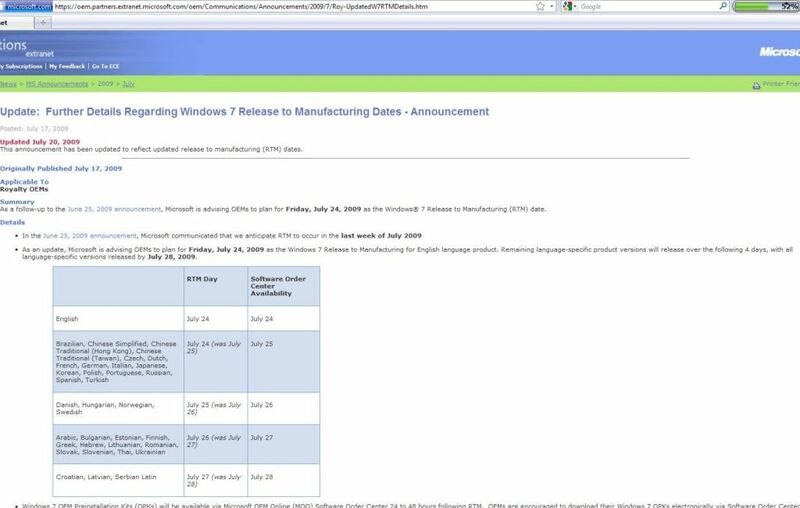 In fact, Microsoft made an announcement on OEM Communications Extranet (OCE) that Friday, July 24, 2009 will be Windows 7 Release to Manufacturing (RTM) for English language product, with remaining language-specific product versions release over the next four days till July 28, 2009. OEMs and system builders can order Windows 7 OEM Preinstallation Kits (OPK) from Microsoft OEM Online (MOO) Software Order Center 24 to 48 hours after RTM, in line with Windows 7 Team blog announcement. According to the same Windows 7 release schedule announcement, MSDN and TechNet paid subscribers will be able to download Windows 7 RTM in English on August 6th and remaining languages by October 1st. It’s expected that the active genuine product keys for Windows 7 RTM can also be generated from MSND and TechNet Subscriber Downloads by then to activate permanently Windows 7 system. All information related to Windows 7 is consolidated here.